The Tree of Life glyph as a whole is designed to teach us about the law of Ain Soph and further describes the birth of the physical light which divides into the four elements and dense matter. Above the Tree of Life glyph are usually depicted three lines, which are considered to be impenetrable. These are called Ain (Nothing; Not), Ain Soph (Limiltless), and Ain Soph Aur (the Limitless Light). The term Ain Soph first appears in the writing of Isaac the Blind of France (1160 -1235), whose real name was Rabbi Yitzach Saggi Nehor. ‘Saggi Nehor’ means ‘much light’ and the name is almost ironic because he was blind. His blindness did not stop him possessing such deep spiritual insight that it was said that he could look into a person and see if they were a new or old soul. Isaac suggested that the Ten Sephiroth have their origins deep within Ain Soph. He believed that Ain Soph is [a mind] emanating Divine Thought. From this Divine Thought emanate the Ten Sephiroth. He taught that living beings are material manifestations of the Sephiroth, and that our mystic experiences aid in ascending the levels of emanation until it is possible to unite with Divine Thought. Ain Soph is identified with the Aristotalian “cause of all causes,” and in the Kabbalah is called the “root of all roots.” It is the substance of God Himself and imminent within all Creation. The first emanation within Ain Soph is called ‘Pure Thought,’ and with Thought comes Will. Gerona Kabbalists, disciples of Isaac the Blind, spoke of the “Will of Thought”, a Will which activates Thought. This monad or part of God began to vibrate and brought forth from within itself many more sparks of light, or aspects of the One God. These spread chaotically throughout the Dark Light. In Ain Soph, this chaos became ordered by the Mind of God. The sparks began to pull together in triangular forms. The research of Gershom Scholem, in his book, ‘Kabbalah,’ describes this triangular formation as the three lights, as the primordial inner light spread throughout the root of all roots. At first, the magnetic pull between these lights was very weak. The points of light or sparks were a great distance apart, with broken magnetic lines weakly connecting and drawing them slowly together. This contraction is the crystallizarion or creation of Divine Light, or the birth of the Shekhinah and, within the Ain Soph, produces the world of Atziluth. With its chaotic magnetic field it becomes clear why fire burns. Atziluth is the archetypal aspect of the element of Fire. The magnetic field of Atziluth has the potential to break up the magnetic fields of the elements and return them to the Divine Light. As the contraction and crystallization of the divine sparks continued, the broken lines of magnetized thought became stable, and a thin but weak magnetic line formed the world of Briah. This magnetic force corresponds to the physical element of Air, making Briah the archetype of Air but, in the Golden Dawn, Briah is attributed to the denser magnetic field of Water (Yetzirah). 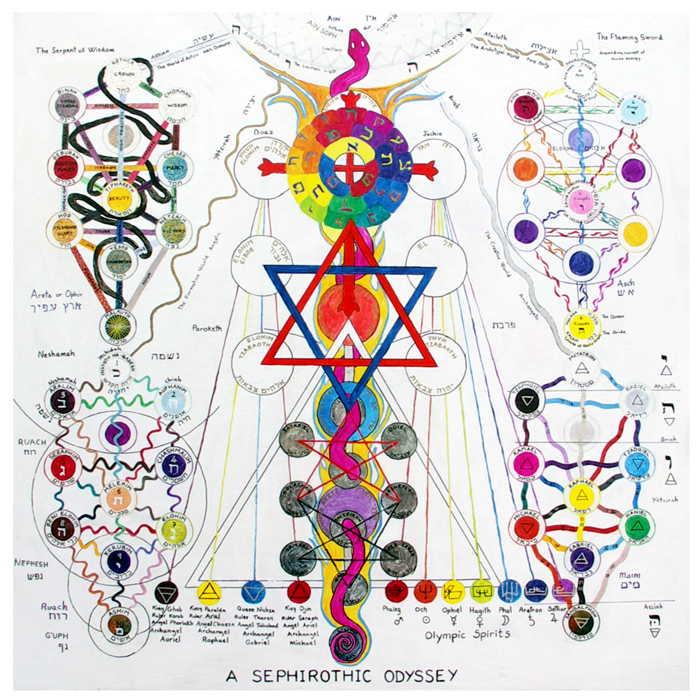 I have ordered it so on the diagram of A Sephirothic Odyssey, and do not have a problem with its designation or placement, as each Kabbalistic world contains the four elements as its frequency slows down. As the points of light are drawn even closer and the magnetic force becomes ever stronger, the world of Yetzirah is formed. This magnetic force equates to the physical element of Water: Yetzirah is the archetype of Water. [The Golden Dawn attributes Air to Yetzirah, thus the Golden Dawn is working a higher frequency of Yetzirah and a lower frequency of Briah.] Once the sparks of light are packed together tightly, this forms the world of Assiah, the archetype of the element of Earth. To summarize: The contraction or crystallization in the Ain Soph generates a Light which is called Will. This Light then becomes the Ain Soph Aur, and eventually creates the Sephira Kether. From Kether the Divine Light flows and gives birth to the Tree of Life, within the sphere of the Four Worlds. 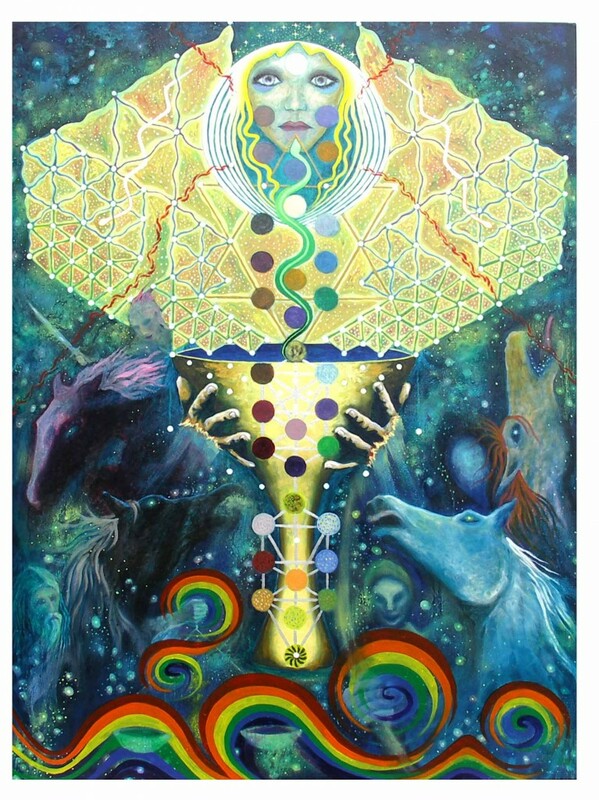 Metatron, by Harry Wendrich: Click on image for further info behind this painting.